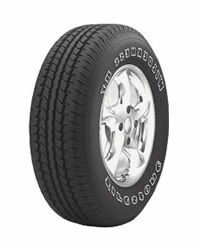 Original equipment for such popular cars as the Ford Taurus and Thunderbird, Firestone's top-of-the-line luxury, all-season steel belted radial represents Firesone's latest technology in a passenger tire development. A tire designed to meet the most demanding requirements of both car makers and car buyers, the FR680 is Firestone's best luxury all-season passenger tire ever for wet traction. All in a tire that delivers a smooth, quiet ride with crisp, obedient handling. S-speed rated to indicate a design speed capability up to 112 MPH, the FR680 is sized to fit many of today's popular American cars. It is available in a choice of white stripe or black sidewall sytling and is backed be a 65,000 mile treadwear warranty.